Kingdom Hearts III Launch Event w/ Bill Farmer & Quinton Flynn! 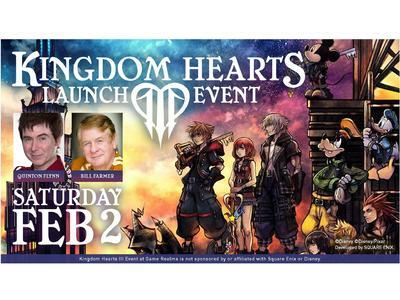 February 2nd, 2019 - 1 PM to 5 PM Kingdom Hearts III Launch Event w/ Bill Farmer & Quinton Flynn! Kingdom Hearts III Launch Event at Game Realms! Game Realms will be celebrating the release of the highly anticipated Square Enix & Disney game, Kingdom Hearts III! Come visit our store to purchase the game, and meet two voice actors from the Kingdom Hearts series to have your games & merch signed! Feel free to bring in other items they have voiced for in the past! Kingdom Hearts III Event at Game Realms is not sponsored or affiliated with Square Enix or Disney. Owing to safety concerns, we ask that all attendees refrain from lining up outside the store prior to the morning of the event. Any persons who leave of their own accord or otherwise, or are asked to leave by law enforcement (or other authorized authorities), cannot be guaranteed admission. Please use your best judgment. The first 100 attendees will receive an event bracelet, granting them priority placement at the start of the line. All bracelet-holders must line up at least one hour prior, to ensure line-stability. Bracelets are not numbered and only guarantee general placement at the front of the line, among fellow bracelet-holders. A secondary line for all other attendees will continue after the 100th participant, without break. The event line will be coordinated in the courtyard, accessible to the right of the store lobby. As the courtyard is exposed to the outdoor elements, please dress and prepare as needed, per your individual comforts and requirements. ATTENDANCE DOES NOT GUARANTEE AN AUTOGRAPH. We will attempt to process as many attendees as the day allows, but please arrive assuming the line will cut off later into the event, as we assess its progress. All attendees are required to behave in a reasonably polite and responsible manner. Any rude or harassing behavior towards Game Realms staff or fellow attendees may serve as cause for expulsion; recipients of event wristbands are not exempt to these rules, and may be subject to the same forfeitures for any such behavior. Attendees must be prepared to surrender any bags they’ve lined up with at the bag check, upon entering the store from the head of the line, prior to meeting with our event guests. Only items allowed beyond bag check wallet, cell phone, and the items attendees wished to have signed. All items attendees wish to have signed should be out and ready prior to reaching the bag check, and all bags can be reclaimed upon exiting the signing area. Any attendees who reach the front of the line may return to the end for a second round. Event bracelet-holders will not receive special placement if returning for a second go, and must advance to the end of the line. Attendees may hold a place in line for any friends and acquaintances as needed, but allowing any late-arriving parties to cut in line is not permitted. Bracelet-holders may not invite non-holders to join them in the advance line (exceptions, such as a parent accompanying a minor, will be made at the manager’s discretion). Cosplay is permitted, but prop weapons are not allowed in the line-up or guest areas, during the event. Photos with prop weapons may be taken outside the store’s entrance, or inside the sales floor or lobby, provided no rough play is conducted. Attendees may bring one (1) item for each of our guests to sign for free, provided they include or otherwise represent the guest’s performance. Please take care not to bring titles the guests have not performed in, such as releases where a character the guest performs as is represented, but played by another actor. Any additional autographs beyond the first one requires payment to the actors. Please note that the payment rates vary with each actor. Event guests may refuse to provide autographs at their own discretion. Please use common sense standards, and do not bring any material that is obscene or otherwise likely to be found offensive. Attendees who do so may forfeit their position in line, regardless of placement. Attendees may take one (1) picture of or with event guests for free. Please have any camera devices ready before reaching the front of the line. Any additional photos beyond the first may necessitate payment to the actor, and are subject to the rates they have set. Attendees are requested to minimize interactions with guests, in order to maintain expediency of the line for other attendees. Greetings, praise and other courtesies are acceptable, but please avoid any anecdotes and complex inquiries. No purchases are necessary to attend, but support for our business is always welcome, and greatly appreciated! The event is intended to begin at 1 pm, but start-up may be slightly delayed based on guest arrival times and other unforeseen factors. We will attempt to keep all inconveniences to a minimum, and we look forward to seeing you on Saturday, February 2nd! 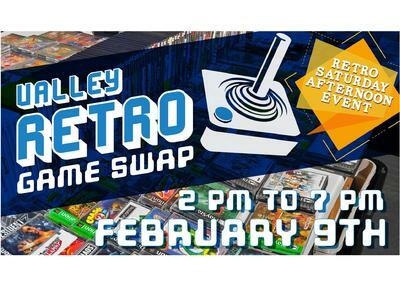 The next Valley Retro Game Swap is going to be held on Saturday afternoon , February 9th, 2019, at 2 PM to 7 PM at Game Realms in Burbank CA! We will also have our first LIVE AUCTION EVENT! Game Realms will be hosting our regular Valley Retro Game Swap! Fans of NES, Sega Genesis, PlayStation (and more!) can come to buy, sell and trade games with vendors, in the Game Realms courtyard! We will also have our first LIVE AUCTION EVENT! Thank you to Romeo for being one of the organizers of these events! February 12th, 2019 - Starts at 9 PM Street Fighter V Tournament! Game Realms is hosting bi-weekly Street Fighter V tournaments! Tournament Starts at 9 PM. Entry fees are $5 for the venue and $5 to the pot. Prize payout of 60% for 1st place, 30% for 2nd place, and 10% for 3rd place. February 14th, 2019 - Starts at 9 PM Dragonball FighterZ Thursdays Tournaments! Thursday Throwdown: Dragon Ball FighterZ - Presented by Game Realms in Burbank California. February 15th, 2019 - Starts around 8 PM Salty Skullgirls, VSAV,GGAC+R Nights! Game Realms is holding the Salty!! Skullgirls 2nd Encore Tournaments & Casuals on Friday Nights! We also got Them's Fightin' Herds, Guilty Gear AC+R and Vampire Savior tournaments and casuals too! February 28th, 2019 - Dragonball FighterZ Thursdays Tournaments!